YouTube showed its first-ever feature-length film on its Screening Room channel this week. The Princess Of Nebraska, directed by Wayne Wang, premiered Friday 20 October. So far the film has had around 160,000 views. Unfortunately, due to messy copyright laws, the video is not available to watch in the UK. 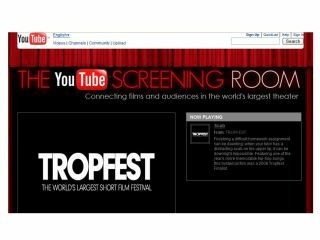 The Screening Room is a section of YouTube that launched in June and has the impressive promise of 'connecting films and audiences in the world's largest theatre'. To give it that cinema experience, there's a velvet curtain framing the movies being screened, and the videos are shown at an improved quality than what is available on the main website. YouTube has been adding a variety of video features to its site to entice viewers to spend a bit longer than the six seconds it takes to watch the Dramatic Chipmunk. For longer videos there's now a self-explanatory Lights Off application and Theatre View, which includes those natty velvet curtains, to make your video viewing that little bit more comfortable.